If you’re having trouble with your Xbox One Kinect Sensor, verify that the sensor is turned on. You’ll know it’s on if the Xbox logo on the front of the sensor is lit. If the Xbox logo on the front of the sensor is not lit, or it’s lit but your console says the sensor is disconnected, follow the troubleshooting steps on this page. If your Kinect sensor turns on without any errors, but you’re still having trouble with it, see Xbox One Kinect support. If your Kinect sensor is plugged in and turned on, but there’s no video in Kinect settings, see Kinect sensor isn’t recognized by your Xbox One console. If your Xbox One console doesn't detect your Kinect sensor, no video will display in Kinect settings, and the Settings menu in the Guide will not show the option to use Kinect mic for chat. Make sure the connector on the end of the Kinect cable is plugged firmly into the Kinect port on the back of the console. If the connector is firmly connected, unplug it, wait 10 seconds, and then plug it in again. If you’re still having trouble, restart your console. Verify that Kinect on is selected. Power off the Xbox One console by pressing the Xbox button on the front of the console for 10 seconds, until it shuts down completely. Unplug the console’s power cable. Unplug the Kinect sensor from the console. Plug the console power cable back in. Press the Xbox button on your console to power up. Plug the Kinect sensor into the back of the console and wait 5 seconds for the console to recognize it. Note If your sensor needs an update, the screen will indicate that an update is in progress. If you haven’t connected to Xbox Live recently, your Xbox One console may need an update. To update your console, connect to Xbox Live by using a wired or wireless connection. 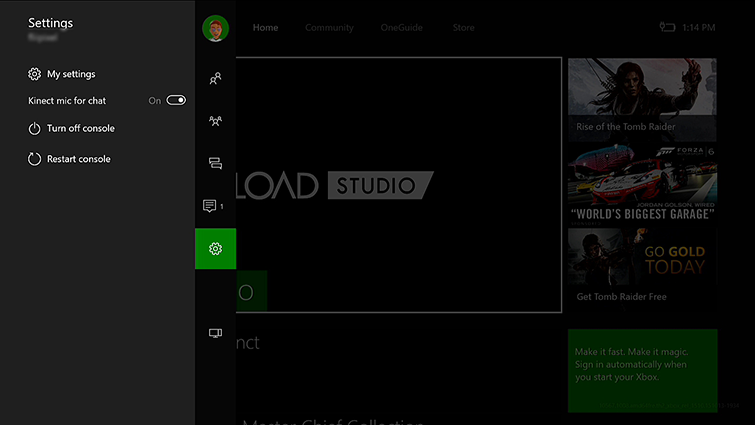 When your console is connected to Xbox Live, available updates are automatically installed. After the updates are installed, test your Kinect sensor and try these steps again if necessary. Note If your sensor needs an update, this screen will indicate that it’s updating, which should take approximately 2 minutes. If the screen doesn’t indicate that an update is taking place, your sensor is up to date. If your Kinect sensor still won’t turn on, it needs to be repaired. See Getting your Xbox console or Kinect sensor serviced for information about how to request a repair. Would you like to contact Support regarding the "Your Xbox One Kinect Sensor won’t turn on" issue you were reading about or a different issue?